Link to Win One of Four $25 VISA Gift Cards! Everybody wins when your patients and providers can easily find a link on your website to the free, evidence-based tobacco cessation services of the California Smokers' Helpline. We are providing a little extra motivation to do so by offering a chance to win one of four $25 VISA gift cards simply by providing a link on your organization's website to the California Smokers' Helpline website at http://www.nobutts.org. 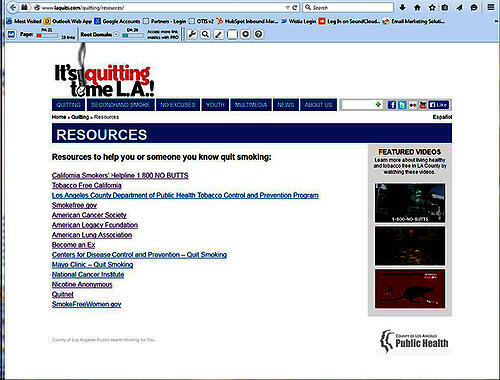 Please also delete any old links to the former Center for Tobacco Cessation website. If you would like to download a free Helpline banner ad like the one below for use on your website, please click here. To be eligible for the drawing, your organization must serve patients and clients in California and you must enter by Friday, February 12, 2016. To be entered into the drawing, just click the button below to provide your contact information and web address for the page on your organization website showing a link to the California Smokers' Helpline website at http://www.nobutts.org.